40 down and 8 to go!!!! Let’s support Steve in his amazing journey sharing “LOVE LIFE” message. Spread the LOVE LIFE message by wearing your own LOVE LIFE sign on your shirt. Support Steve Fugate and his Love Life Zig Zag walk across the country. For more information on Steve and his story please visit http://www.lovelifewalk.com and visit him on his facebook page Love LIFE walk. 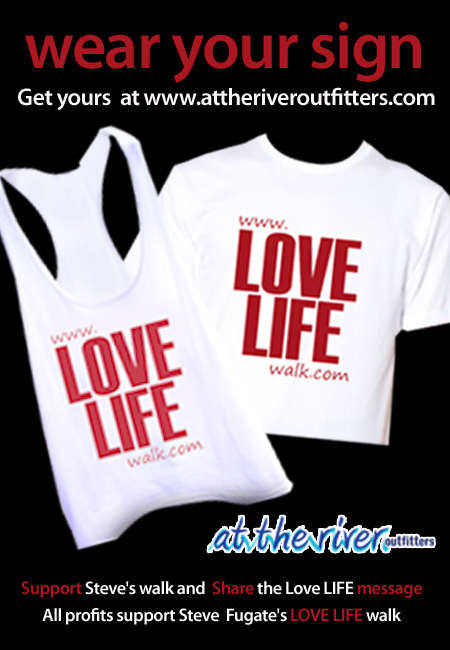 All profit from each LOVE LIFE sale goes to the LOVE LIFE walk. This page is dedicated to those projects and causes we personally believe in and support with our time, talent, and by donating a portion of proceeds from each sale. By purchasing these products you too will be supporting the cause, both by the contribution we will make from the sale as well as raising awareness for the charity each time you wear your shirt. I had the honor of meeting you today! I’m the lady that you found on the top of Torrey Pines Rd. Hopefully you found your way to La Jolla Blvd and from there all the way to Sea Port Village and Coronado! Your positive attitude and love of life made a difference in my very rushed life. I will show your life to my three kids! You are an amazing person! This is the website administrator. Please note your message has been forwarded to Steve; however, he is not able to directly respond thru this website. For future reference, please contact him ANYTIME by phone at 914.772.4244 or via a Facebook message at https://www.facebook.com/LoveLifeWalk or at https://www.facebook.com/stevelovelife. Thank you & Love Life! How can i donate to steve to help him out? you are an inspiration to me daily. thank you .